I'm happy to report that the answer to those doubts in my mind is YES! 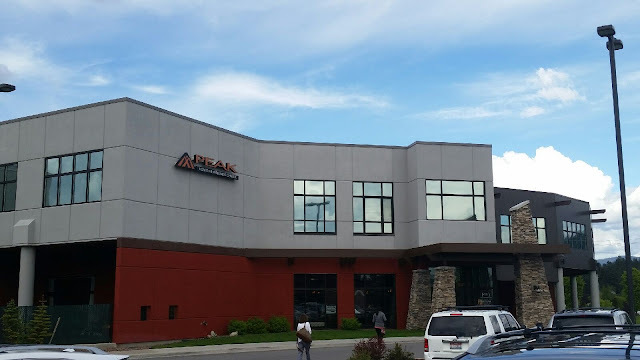 The team at PEAK Health & Wellness has been focused on providing the best fitness experience in North Idaho for more than 30 years... and it shows. I feel comfortable at Peak and I don't feel I am being judged at all... in fact, I actually enjoy going! Last week I went to the gym 5 times and spent over 4 1/2 hours exercising. There was even one day I even went twice! I will admit that the first day I went, I had been on the elliptical machine for less than 5 minutes and I felt like I was going to die! My knees were killing me, I was out of breath and I would have loved to just stop and go home. However, my children (13 and 16) were with me and they helped push me through it. Yesterday when I went, I walked for 45 minutes on the treadmill! 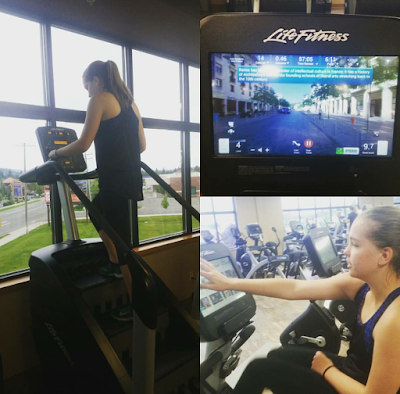 My favorite machines are the Life Fitness bikes, elliptical machines and treadmills because you can choose a course and explore different monuments, national landmarks and famous cities around the world! Just last week I biked through Paris and walked through parts of Yosemite, the Grand Canyon and Bryce Canyon National Park. This is where my daughter and I spend our time... exploring! My son and husband spend the majority of their time doing free weights. 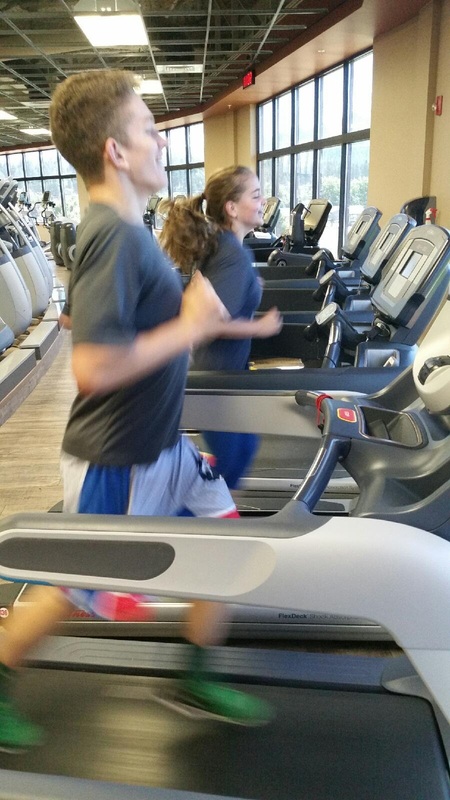 My son participates in high school sports, so this gym has been the perfect addition to his training regimen! I love that fact that there are people working out that are all of all ages and fitness levels! It's not a gym filled with "perfect bodies" and "gym rats" but rather a gym where everyone fits in and can feel comfortable working out. Their facility (Peak Tennis in Hayden) is wonderful. It is clean and organized to the point of being spotless. It also smells good and is very inviting from the moment you walk in. Downstairs they have a beautiful fireplace and lounge area, tennis and pickle ball courts, pro-shop, juice bar, group fitness and yoga studios, and spacious locker rooms complete with showers and saunas. Upstairs are the weight room and cardio room. I love the cardio room because you have a great view of Canfield mountain. The entire staff is friendly, welcoming and very helpful. We are always greeted with a "Hello, how are you today" and a smile! When we leave, it's "Have a great day!" When you join Peak Health & Wellness Center... there is an amazing added bonus. One membership gives you access to 3 different gym locations: Hayden, Post Falls and Coeur d' Alene! Are you looking to energize your workout, shake-up your routine, or amp up your fitness goals? If you are, Peak Health & Wellness Center is your answer! Be sure to check them out! At Peak you and your family can enjoy yoga, spinning, swimming, racquetball, pickle ball, tennis, basketball, personal training and so much more! Do you have a gym membership? If so, what is your favorite thing to do when you go to the gym? This review is based strictly on my own personal opinion. Others may have a different opinion or experience with the product or company listed above. I was provided a complimentary summer membership for my family free of charge by the company or PR agency and I provided my honest opinion. No other type of compensation was received for this review. I love working out at Peak... The atmosphere and other gym-goers in there are much more pleasing to be around than other gyms I've been to in the past. Sounds like a great gym! Finding the right gym is so important. I don't have a membership but I do have a treadmill. I set it up the living room. My daughter (19) has a gym membership and she loves it. She says the trainers there are very helpful. Keep up the great work! Health is so important. Good for you! Keep it up. When my youngest goes to Kindergarten I will join our local gym!